Children love sweet treats. Children have more taste buds than adults and are more sensitive to sweet flavors, which may be why they crave sweets more. How can we help them avoid overindulging with all the birthday celebrations, holidays and treats available? One way to minimize the allure of and desire for sweets is to serve dessert with dinner. This makes dessert seem like part of the meal, not something children have to work for by eating foods they haven’t tried yet or don’t like. They may grab the dessert first, but over time, they will learn that the other, healthier foods on their plate are the ones that provide them with more nutritional value and energy. Let your children decide when they’ve had enough; they may start out overeating, but they will quickly learn that too much sugar makes their stomachs hurt and can lead to headaches, hyperactivity and tiredness. Let your children know that they can and will have more sweets another time, so they don’t feel like they’ll never have a chance to have this “bad” food again. Make sure that your children mostly eat healthy, good-for-you foods that help bodies grow, and the rest can be fun foods, like sweets and salty snacks. Children can grasp this concept, and it helps them make decisions about what to eat. As parents, instead of describing sugary foods as bad, we can explain to children that these foods have very little nutritional value and won’t help them grow healthy bodies. If we see sweets as an occasional pleasure that won’t offer us a lasting boost in energy instead of as something forbidden, we may be healthier for it. Most parents count on summer itself to promote physical activity and raise-your-pulse exercise. The longer, warmer days beckon us and our kids outside and things just seem to happen. But then it’s back to school, logistics take over and couch potatoes (in both generations) often re-appear. It’s worth thinking about this transition now because now is when it’s happening. Many of us hit upon the idea of the logistical solution – find a class, join a team – if it’s in the schedule, it’s more likely to happen. And as we – and the preschools and kindergartens to which we send our children – all know, regular exercise is a very good idea. The old myths that young children are inherently sufficiently active, or that too much activity can harm the growing body – tales I heard from my grandmother – have been replaced with growing concern about shocking obesity levels in young children due to passive daily lives and unwise nutritional patterns. We know that there are short and long-term physical and mental benefits to regular exercise and that there are no short cuts to those benefits. Active play time should never be withheld as punishment. **Note to parents: are you sending your child off with the right clothing for such activities? This is a surprisingly frequent concern among teachers. But children learn better from what they see and experience, than from what they are told. So – as a family – keep fitness activity as a year-round habit. Visit your playgrounds regularly and make it fun. Bring along some extra things like large balls, kites, ropes for jumping and (supervised!) tug-of-war. You can enrich the time by making an obstacle course (enjoyed by any child who can walk) through the playground and see who can remember it or finish it fastest. Many families treasure weekly family walks. It generally takes some humoring for the more balky ones, but scavenger items usually work for our children. When weather interferes, get out the large balls, exercise mats and Twister® games, or download some stretching and balancing exercises (to do together) from family fitness websites. Remember; keep your children away from exercise equipment for safety reasons. In a survey by the Outdoor Foundation, it was found that children are primarily motivated by their families to participate in outdoor activities. What better way to get children outdoors and active, than by going on a family hike? Below are some tips for planning your hike so the littlest of hikers have a fun and rewarding experience. Plan your hike in advance. When children are joining you, it’s always nice to hike towards a goal like a lake or waterfall so they’ll be motivated to keep trekking along. The sites listed below are great resources for selecting a location and trails to explore: www.outdoorfoundation.org, www.appalachiantrail.org, www.americanhiking.org and www.hikesafe.com. Be prepared! Gear everyone up with appropriate, well-fitting hiking shoes or boots and comfortable, breathable clothing — bright colors (for little ones mostly) and layers are best. Stock your backpacks with Deet-free bug spray, water, snacks, a well-stocked first-aid kit, GPS unit and rain gear, just in case. If a child is too small to walk on their own, consider using a backpack carrier rather than a stroller. It’ll be easier to maneuver over the terrain with baby in tow and they’re sure to enjoy the “bird’s-eye” view. Establish and discuss “rules of the trail” before you head out, e.g., staying quiet to not disturb the animals, plants to steer clear of, not running off, etc. Start with short hikes on easy trails with fairly flat surfaces to get everyone accustomed to the hiking experience. Take your time. Go slow so everyone can keep up, but also to enjoy and explore your surroundings. Geocaching or playing games on your hike are great ways to keep children interested and moving along. Visit www.geocaching.com to find out more about this fun outdoor family activity. Focusing your child’s physical fitness on fun activities will increase your child’s ability to move with confidence and competence. Exercise increases overall metabolism, builds a healthy heart and lungs, strong bones and muscles, and improves coordination, balance, posture and flexibility. Encourage babies to explore activities that allow for reaching, rolling, sitting, crawling, pulling themselves up and walking. ‘Tummy Time’ is the perfect opportunity for babies to practice lifting their heads and develop strong muscles. Placing toys just out of reach encourages babies to reach for the toys, assisting in physical development. Support young toddlers mastery of walking by allowing them to be active! Play with them as they learn to run, hop, dance and throw. Have them chase bubbles or invent a silly walk – play becomes exercise. Remember to always provide encouragement to toddlers as they build self-confidence. 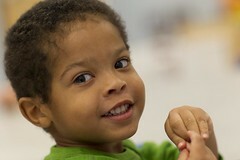 Preschoolers need plenty of time and space to run around and play. Taking your child to a playground or park is a great way to release energy and exercise! Encourage creative dancing and riding scooters and tricycles. Play ‘Statues’ by playing up-tempo music. Have your child move while the music is playing and freeze into a statue when you pause it. Play outside with your child and teach hand-eye coordination by showing the basics of throwing, catching and kicking a large, soft ball. An effective fitness program includes activities that promote physical activity in ways that are creative and fun, is clear and easy to implement, incorporates fun materials, includes opportunities to enhance personal and social skills, and integrates into other life experiences. At the preschool level, there are a number of fun and exciting ways to introduce health and fitness at home. There are basic motor skill development areas to concentrate on such as running, jumping, hopping, galloping, side sliding, and leaping. There are also basic object control skills, which commonly use a ball such as rolling, throwing, catching, dribbling, kicking, and striking. Experiences with music and movement can enhance spatial awareness, basic body identification, loco-motor and non loco-motor skills, rhythm skills, motor memory, creativity, problem solving, language and listening skills, role-playing, social interactions, and self esteem. Dance to the beat of your favorite music. When you hear FREEZE, stop and pose like a status. Then start the music again. Move your eyebrows up and down, move your nose like a bunny, move your cheeks like a frog, move your mouth like a fish, move your tongue like a lizard, move your arms like a gorilla! Michelle Obama recently announced “Let’s Move,” a national campaign to combat childhood obesity through fitness and nutrition programs. Placing children on the right path to living and maintaining a healthy lifestyle is essential, and that is why Goddard initiated its “Get Active” campaign. Every day inside and outside the classroom, 360- plus Goddard Schools nationwide take great strides to get preschoolers, toddlers and infants up and moving. 1. Take It Outside – Limit “screen time” and encourage your child to go outside and PLAY. Have a relay race, set up an obstacle course or bring back one of your favorite childhood pastimes like hopscotch or jump rope. 2. It’s In Your Nature – Take your child on a nature walk. Use this great opportunity to talk to your child about plants and animals you see while getting fresh air and exercise. 3. Get Dramatic – When you’re transitioning a child from one activity to another – like play time to dinner time – ask them to move like their favorite animal. Hop like a kangaroo, slither like a snake or waddle like a duck. 4. Be a Good Sport – Preschool age children love to learn the basic rules of popular sports and games. Take this opportunity to talk about sportsmanship. 5. Be Free – Remember free play? Let go of some structure, and encourage your children to use their imaginations in their indoor and outdoor play. 6. 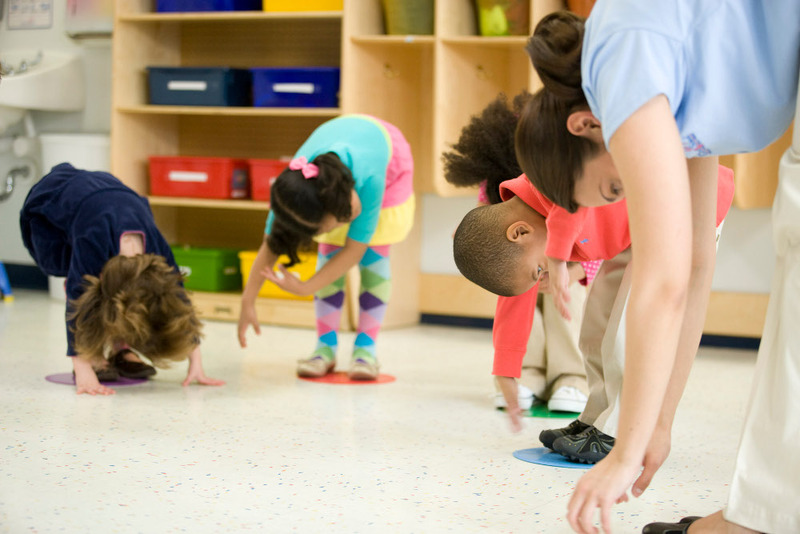 Stretch It Out – Preschoolers love basic yoga moves. Take a few minutes each day to stretch with your little one. 7. Put Some Movement In Your Music – When you sing songs or listen to music with young children, encourage them to dance with scarves, make up movements to go with the lyrics or just DANCE and move their bodies to the music. As childhood obesity rates climb in the U.S., pediatricians suggest we should encourage kids to get active at a young age. A quick and fairly easy way to get your children active is through yoga. The practice of yoga is a valid method to condition the body while relieving stress, and has been included in the curriculum for the Goddard Schools nationwide. Yoga also enhances cross-curricular learning for children and is an easy way to incorporate physical fitness into their day.